Last week I went on an adventure that included all of the things in my headline. 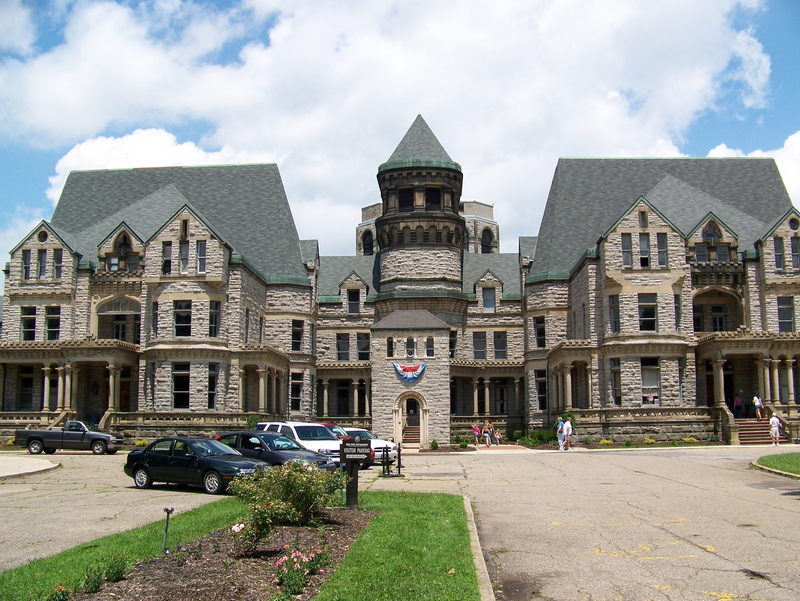 I do not know much about Mansfield, but it looked a lot like Youngstown but has some very interesting tourist spots. Really, Mansfield is a great combination of off-the-beaten path attractions. How many collections of biblical wax figures can there be, especially when coupled with a former reformatory, carousel and coney dog shop? My day started at Biblewalk, an attraction at Diamond Hill Cathedral. Visitors can choose from four tours: The Life of Christ, Miracles of the Old Testament, Museum of Christian Martyrs and Heart of the Reformation. I selected the Life of Christ tour, for $4.95 with my AAA card. I did not know how the tour would work, other than it was self guided. Actually, it occurs in a group if there are others present, and there were. I was amazed. I had no idea of the popularity of the museum, but low and behold, there were 10 people on my tour, and after some basic instructions from an employee and more in-depth instructions to our self-appointed group leader, we were off on our hour-long tour of Jesus’ life. 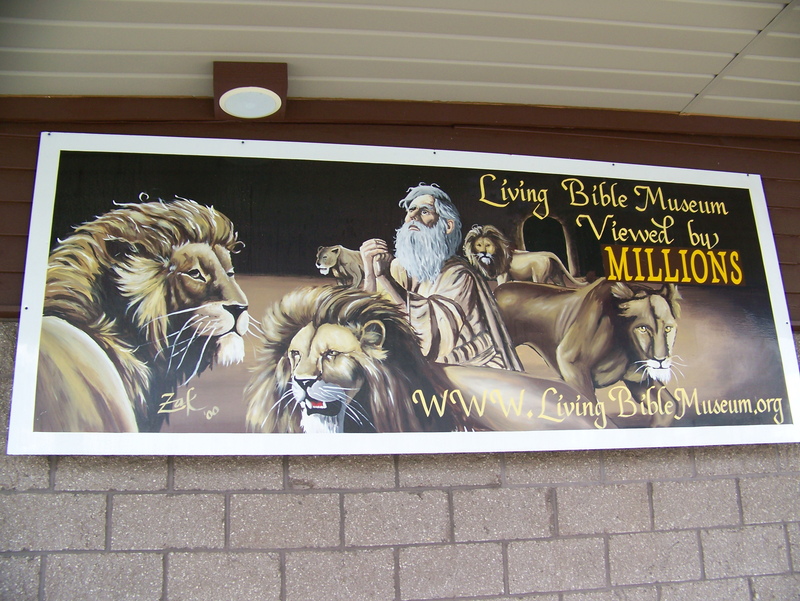 The tour was set up with stops at mini stages with painted walls, lighting and biblically dressed wax figures. The narration came from a recording that was played sometimes automatically and sometimes by the press of a button. The first stop included booming thunder and the booming voice of God. The tour was quite serious, but when we got to the scene where Jesus brought a girl back to life just by touching her, we laughed, because the wax figure actually breathed! Her stomach went from still to rising. The next stop was also memorable, because it was Jesus preaching to a group of children, but these were no biblically dressed kids. There was a Native American girl, a Dutch girl with a pointy, white hat and yellow clogs, an Amish boy, a girl in a Spanish dancing outfit and a handful of girls in kimonos. I don’t really think it happened that way, and we all seemed a bit puzzled, but then it was time to move on to Jesus’ death. Once the tour was complete, I had to skedaddle, because it was time to get a ticket for the prison tour. Conveniently, both the Biblewalk and the Reformatory are on the same street, so it’s less than a 5 minute drive between them. On weekdays, tours are available of the whole building at 2 p.m., and tickets are sold beginning at 1:30 p.m. I didn’t know if there was a limited number of tickets, so I wanted to be there as early as possible. There ended up being about 50 people on the tour, but as the tour progressed, I came to realize that most people in the group didn’t care what the guide said, so I didn’t have to fight the crowd to be close enough to him to hear. Upon entering the now glass-enclosed central congregating area that is used for weddings and parties, I got my first glimpse of the cell area. 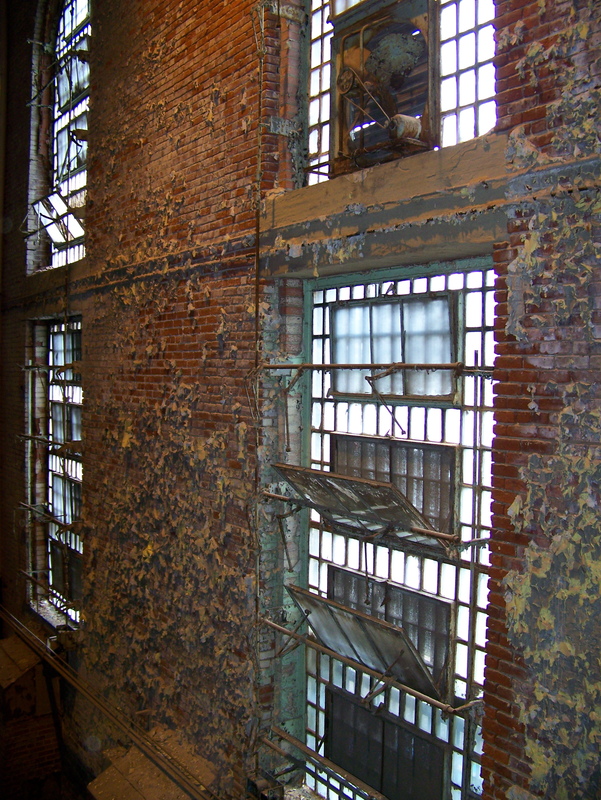 The brick walls are covered in peeling paint and everything looked quite run-down. I couldn’t imagine that we were actually going in there, but we did after hearing some facts about the building. The first prisoners (only young men ages 16-21) arrived in 1896. There were a total of 156,000 prisoners in the history of the prison. It cost $3 million to build and today, would cost $15 million to repair to its original luster. 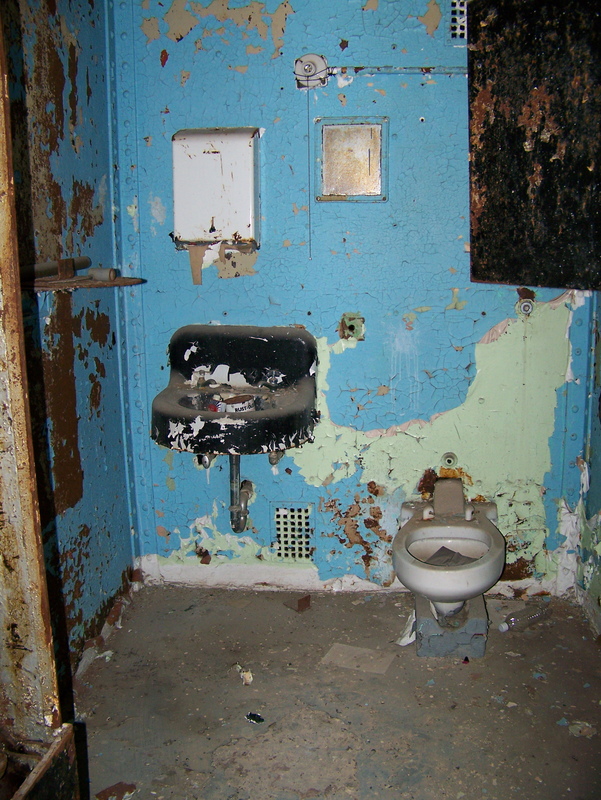 The West Cell Block is different from the East Cell Block because the West’s cells are built of concrete and steel, but the East’s cells are built of only ½-inch pinched steel. Neither have any supports, so the five floors in the West and six floors in the East, which makes it the largest free-standing cell block in the world (it can hold 1,212 inmates at a time), are quite imposing. In 1970, the East became maximum security, including housing death row prisoners on the lowest level. The building was condemned in 1983 but continued operating until 1990. We were led into the East Cell Block, climbed up a couple of flights of stairs and walked down the gangway in front of all of the cells. This was really quite amazing. The whole time I felt like I was in another decade, with little lighting and dark and dingy cell blocks, and I almost thought I could find a prisoner still locked up in his cell. It was one of the strangest things I’ve ever experienced. Next, we toured the library, still with books lying around and an incredible amount of debris. In the 20 years since this prison closed, nothing very noticeable has been done to it, leaving it in intense disarray. Honestly, I was worried for my safety a couple of times. Lights and pieces of plaster hang precariously from the ceiling. Floors are uneven and the debris isn’t cordoned off. How is this up to code? Regardless, we continued on, walking past death row and then into an area with some “Air Force One” and “Shawshank Redemption” props. Both movies were partially filmed on prison grounds. We continued our tour in through the hole, which is solitary confinement, and then through the West Cell Block, the chapel and then the administration area, which was falling apart as much as the rest of the building. 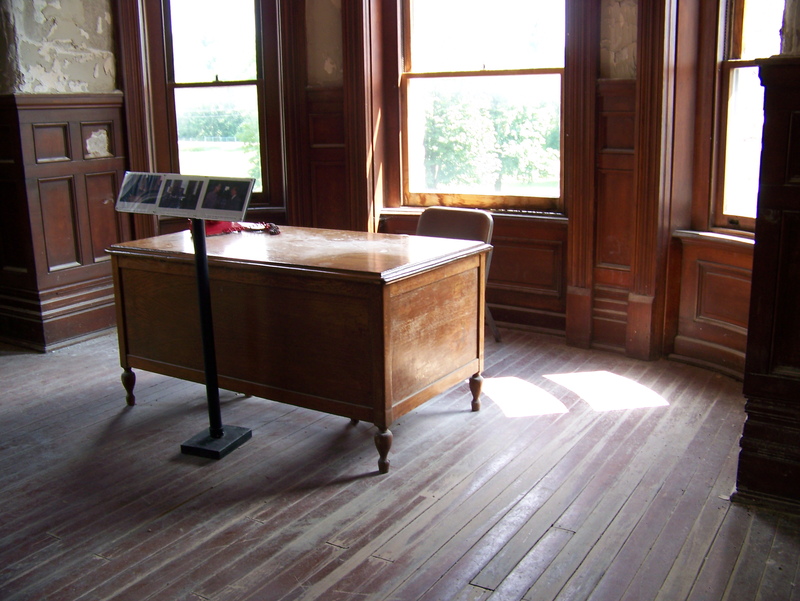 You can see the warden’s office from “Shawshank” that includes the desk, telephone and hole in the wall from the safe. The pane of glass is also still missing from the window that was broken after Andy hijacked the record player. You can also see the real warden’s office and the living quarters for the family of the warden. To see a bit more about the prison, watch my video below, and then continue reading about Richland Carrousel Park and Coney Island Diner. Richland Carrousel Park is in downtown Mansfield, a couple blocks from the main square. It’s hard to miss, with horses out front and carousel music playing. Riding the carousel costs 75 cents, a small fee for a step back in time. I was the only person above the age of 5 riding the carousel, but that doesn’t matter. I don’t remember the carousel in Sandusky’s carousel museum, but I’m sure both Sandusky’s and Mansfield’s carousels are equals in greatness. This carousel was beautiful and well cared for. Really, it was immaculate, which was such a change from my earlier stop at the Reformatory. Part of the reason this carousel is so lovely is because it was built new in 1991. 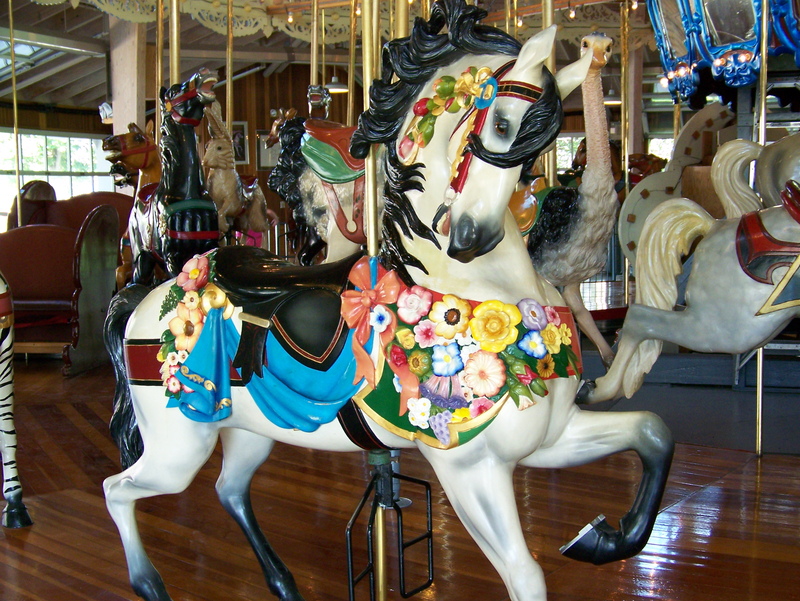 It was the first new, hand-carved carousel to be operated in the U.S. since the early 1930s. There are 30 horses, 22 menagerie figures (like ostriches, cats and rabbits) and two chariots. Each figure was designed, carved and painted in the style of the early 1900s carousels. 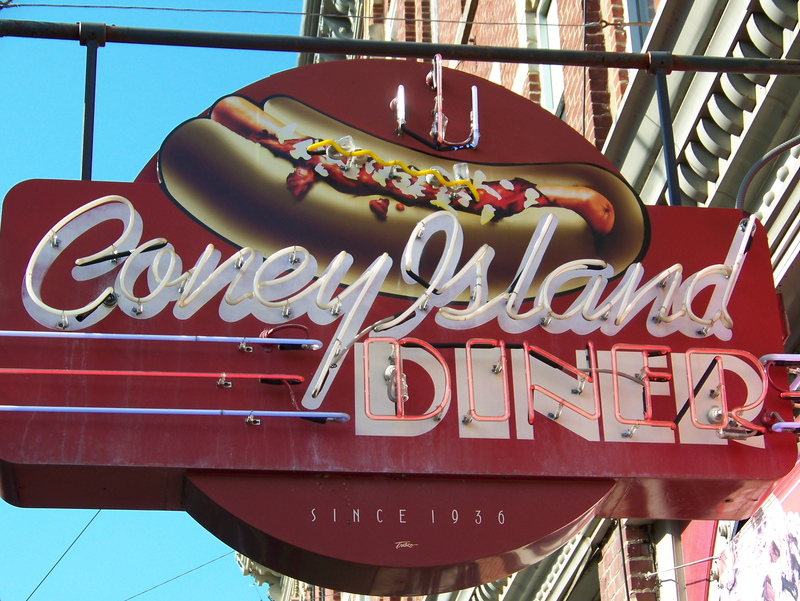 Check out my video below, and then read on about the Coney Island Diner. For dinner, I stopped at the Coney Island Diner, across the street from the carousel. The diner was a step back in time, just like the other activities from my day. The coney dog didn’t wow me, but the fries were delicious. I ended my meal with a root beer float, an antiquated drink for the end to my antiquated day. To see more pictures, click the photo below. This entry was posted in Movies, Photos, Travel Narrative, U.S. and tagged Carousel, Food, History, Ohio, Prison, Religious, Travel. Bookmark the permalink. Great photos and videos! I really want to make a trip to Mansfield now. So happy you enjoyed our Carousel! I’m a native of the Mansfield Area and now work for the company that built the Carousel helping create and restore Carousels around the world. Oddly enough, I’ve never been to Biblewalk, the Reformatory, or the Coney Island Diner. I do love driving through Downtown Mansfield – I wish some big factory would come in and provide the jobs and economic boost so badly needed to restore and fix so many of those beautiful buildings.